Creating Residual Income for Your Business! Are cash flows still a struggle for your business? Do you have clients that buy from you more than one time? Do you need to learn how to improve your financial stability in any economic climate? I can say for sure there is one thing that I have learned in all businesses I have started to date. Simply put, it is clear that businesses are much stronger and stable if they are built with systems that drive re-occurring, residual income. To build this type of business model, I believe you have to be willing to think and sell your products/services differently. You need to be open to diversifying the service offerings you have and strategically focus on re-inventing yourself to achieve this. When I founded Sharp Innovations, Inc. in March of 1999, perhaps I got lucky. I truly believe however that I had an innate understanding about these principals. I believe my humble years growing up were a teacher. When our family struggled to make ends meet, it proved that I needed to learn how to be wise with money. My father was perhaps one of the most brilliant janitors that ever lived in terms of how financially savvy he was in a street smart sense. This was despite his blue collar role and lack of higher education. I thank God that I was able to learn from him and then apply that foundation to my first successful business many years later. I was able to initially setup residual income from the monthly hosting of the early websites I built in my bedroom for my first clients. It didn’t take long for us to grow to hundreds of clients and really build an increasing percentage of residual income for our business as we measured it against total annual sales. We further diversified our services as we added staff, expanded capabilities and met changing client needs. We diversified our residual income generating services over the past decade into: web hosting, a myriad of web maintenance options, search engine optimization, analytics reporting, and computer networking services. We were able to build what I see as a “cash flow farm” that had accelerated cash flows and produced much greater stability for our organization. We have had our clients pay upfront for our services or in scheduled / re-occurring methods since inception. Clearly if we have hundreds of companies that have been willing to do this over more than a decade of business, then it isn’t a fluke. 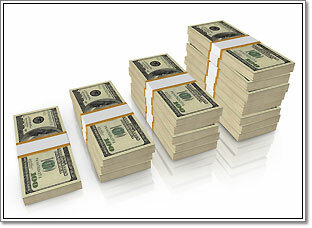 Historically our residual income generating services have supported 35-50% of our companies annual income needs. Beyond that we have historically achieved the lion share balance of our income through pre-payments by offering a discount, or through scheduled payments via signed agreements. The interesting thing is that the payment options were simply developed by trial/error and response to client feedback from our early years in business. We also have a large percentage of our income that is scheduled through credit cards and e-check debits which creates greater cash flow consistency/predictability from the collections perspective. We also can easily help our clients setup these collection methods as well through their websites we manage. You could offer service/warranty arrangements with payment options. Many product based companies, can learn to create intellectual capital and package their wisdom in unique ways so they can sell their knowledge as services. Many companies could look at what new services could be offered by doing some competitive analysis or simply doing a customer feedback survey and realizing what new, consistent needs are being presented. All companies could create value-added services that could be private access to your clients for monthly, quarterly or annual fee structures. Many of these ideas could be made accessible via your company website and easily done by offering unique value, conveniences and information to your clients beyond what the public can access. Strengthen your team morale and ability to weather any economic storm! Hopefully you can see how creating re-occurring, residual income can drastically bolster your company effectiveness from a financial perspective. There are so many other by-products though like: increased new client buyer confidence in the stability of your firm, better bank leverage opportunity, better employee retention/confidence, as well as attracting top new talent because of a track record that instills performance/confidence. Lastly, I close saying that I feel the most important benefit is that when this is done well you can shape your business to be able to weather any economic storm that comes as time goes on. I can attribute our ability to do that in this current depression in large part because of these principals and I pray I encourage you to seriously explore the re-evaluation of your business model. If you already shine in this area then kudos! If not, I would be glad to have a personal, brainstorming consultation with you. I help my coaching clients focus on matters like these so they can see their business become more efficient, profitable and scalable, if desired. I also help them achieve better balance professionally and personally so they can see their business truly work to support their life purpose and vision. If you want to find out more about how this could be leveraged in your world, or if you want to discuss a business problem you are facing, feel free to contact me or call me personally at 717-615-2274. You are also welcome to share this article or other resources found on my blog (visionandpassion.wordpress.com) with those you care about. Feel free to contact me if you or an associate would like to join my blog or receive this article as a PDF. Posted in Entrepreneurs, Leadership, Sales / Marketing and tagged Entrepreneurial, Leadership, Sales/Marketing on June 3, 2009 by joesharp.